Like most pies, if you are learning how to make caramel pie recipes you can use almost any type of crust. Because caramel flavor is usually very light, it will blend with almost all pie crust recipes. The filling for caramel pies can be made with many different ingredients. Quite often you will find recipes that have fillings made with milk, light cream and heavy creams. Some are made with canned milk and creams. Ones made with canned evaporated milk and sweetened condensed milk are usually richer in taste but very delicious. When you learn how to make caramel pie recipes you will also come across recipes which use other liquids. Water, juices and liquids like coffee are sometimes used to make the filling. Often milks and creams are also used along with these liquids. Even without “the milks” the fillings can be made rich and tasty with ingredients like cream cheese, sour cream and butter. Where do we get the “caramel flavor”? When I think when I learned how to make caramel pie recipes I only thought about using brown sugar and butter. Since then I have learned that other ingredients can be used. Most of my recipes do have brown sugar in them; both dark and light brown. 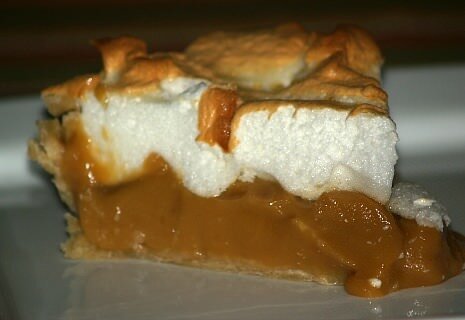 Caramel candy is another very popular ingredient to be used in caramel pies. I have been surprised to see how many caramel pies, as well as other recipes are flavored with caramel ice cream topping. Another popular ingredient you will find listed in caramel pie recipes is caramel chips. I have had many of these which add a lot of flavor but I have also had some which are not so good. Unlike the chocolate chips, I have found some of the caramel bits do not have much flavor only sweetness. Like most pies, toppings can range from crumbs, nut, meringue, whipped topping or can be served without topping. If you like apples, you will love the pie with caramel and nuts used for the topping. This is even better topped with a scoop of ice cream! If you are learning how to make caramel pie recipes you might like to try the following crust recipes. Learn how to make caramel pie recipes with a canned milk. Combine all ingredients in large saucepan; mix well to blend. Cook mixture stirring constantly over medium heat until thickened. Dump mixture into baked pie shell; top with meringue and bake at 350F degrees until lightly browned. NOTE: You can use the same recipe for meringue as below. When you learn how to make caramel pie recipes you can use this recipe for graham cracker crusts. COMBINE ALL ingredients and mix well; press into bottom and sides of 9 inch pie shell. Bake at 375F degrees for 6 to 9 minutes until edges are slightly browned; cool. When you learn how to make caramel pie recipes use this never fail pie crust recipe. COMBINE flour and salt; cut shortening into flour mixture. Combine vinegar and milk; immediately stir into flour mixture. Turn out onto floured surface and work until smooth; divide dough in half. MAKES a double crust or 2 single crust. Combine and blend 1 cup sugar, flour, salt, milk and beaten egg yolks. Cook over medium heat stirring constantly until mixture is hot. Sprinkle remaining 1 cup of sugar in heavy skillet over medium heat. Cook and stir sugar until it is melted and turns golden brown. Gradually add melted sugar to hot custard mixture stirring constantly. Continue cooking and stirring until custard comes to a boil and thickens. Stir in the butter and vanilla; set off heat. Prepare meringue; spoon custard into baked pastry shell and top with meringue. 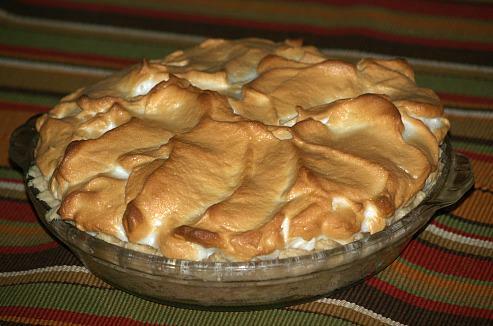 If you are learning how to make caramel pie recipes, you might like to try this meringue recipe. COMBINE whites and cream of tartar in a large mixing bowl; beat on high speed until foamy. Beat in vanilla; spread over hot filling and bake on 350F DEGREES until meringue is light brown. Combine and mix pumpkin, milk, eggs, sugar, flour, salt, flavorings and butter; pour into unbaked pie shell. Bake at 425F degrees for 10 minutes; REDUCE HEAT to 350F degrees and bake 40 minutes longer. TO MAKE TOPPING combine and mix pecans, melted butter and brown sugar. Sprinkle topping over top of pie; place UNDER BROILER until topping is caramelized (It will bubble). Cool to room temperature; store in refrigerator. Serves 6-8. Sprinkle gelatin over water in a small saucepan; let stand 1 minute. Stir gelatin over low heat until completely dissolved; stir in 1 cup of the cream. Bring gelatin mixture just to a boil; remove from heat and stir in chocolate chips until melted. Beat or process in blender the chocolate mixture, remaining 1 cup of cream, eggs and vanilla until blended. Place bowl in refrigerator until thickened about 15 minutes. Combine caramels, ¼ cup cream and butter; heat and stir until caramels are melted. Pour caramel mixture into baked crust; cool 10 minutes. Take gelatin mixture from refrigerator and beat or whisk until smooth. Pour mixture into crust and chill until firm; garnish with additional whipped cream. COMBINE AND BLEND 2 cups of wafer crumbs, pecans and butter; press into bottom and sides of 9 inch pie plate. Bake at 350F degrees for 10 minutes; cool. Learn how to make caramel pie recipes that use a graham cracker crust and is made with coffee. Heat caramels and milk in a heavy saucepan over low heat until caramels melt; stir frequently. Soften gelatin in coffee; add gelatin to caramel mixture stirring until gelatin is dissolved and blended. Stir in salt; chill mixture to the consistency of corn syrup stirring occasionally. NOTE: Watch closely; caramels set up mixture quickly. When gelatin in partially set (consistency of unbeaten egg whites) fold in stiffly beaten whipped cream. Fold in nuts; chill until mixture mounds when spooned. Turn mixture into prepared crust; chill several hours before serving. Learn how to make caramel pie recipes with apples and pecans. Roll half of dough and line a 9 inch pie plate; sprinkle bottom with ¼ cup pecans. TO MAKE FILLING combine apples, sugar, cinnamon and lemon juice; toss to coat. Spoon apple mixture into pie shell; top with rolled remaining pie dough. Trim dough around edges, crimp edges; cut slits in top for steam vents. Bake for 35 to 45 minutes until crust is golden brown and apples are tender. Drizzle caramel topping over pie; sprinkle top with ¼ Cup chopped pecans. Combine and mix together sugars, flour, salt, scalded milk and cream, beaten eggs, maple and vanilla. Pour into pie shells; bake 10 minutes at 375F degrees. REDUCE HEAT TO 350F degrees; bake until centers are set. TO ASSEMBLE PIE combine in top of double boiler unwrapped caramel candies and milk. Heat mixture over boiling water stirring constantly until caramels melt. Remove mixture from heat and stir in chopped nuts; spread in bottom of baked pie shell and COOL. TO MAKE CARAMEL CREAM combine brown sugar and cornstarch in saucepan. Gradually stir milk into brown sugar mixture; blend in beaten egg YOLKS. Cook and stir constantly over medium heat until thickened; beat in butter, cover and cool. Beat egg WHITES until frothy; gradually add sugar beating until stiff peaks form. Fold in sour cream; fold mixture into cooked filling and pour into prepared pie shell.